And now, I continue with the second half of my Kyoto visit. 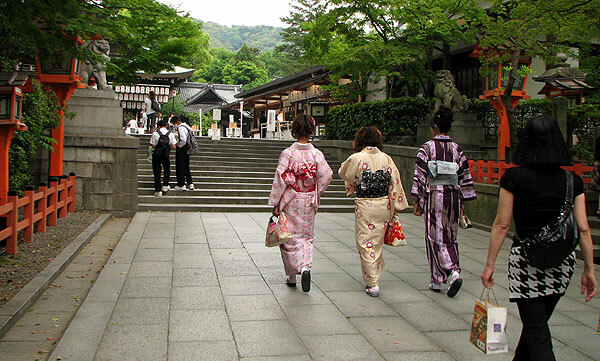 After visiting the Golden Pavilion, my hosts took me to the Kiyomizu Temple area. The entrance from the street is very eye catching and bright. Other sightseers are all dressed up! A deva gate, with other spectacular architecture in the background. 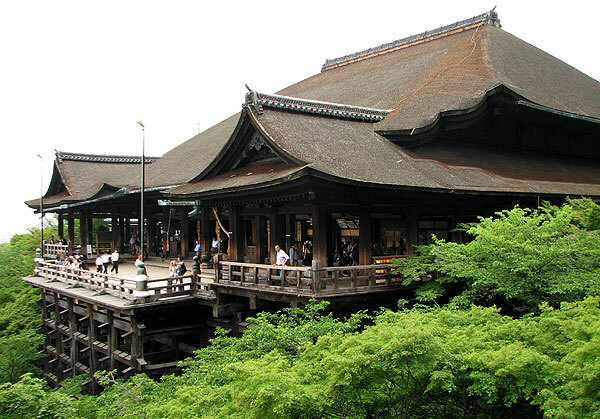 The main hall of the temple comprises a verdana with very tall pillars that offer a spectacular view of Kyoto. An old Edo period tradition was that anyone who could survive the 13m plunge from the edge of the veranda would have their wish granted. 234 jumps were recorded during the Edo period, 85% of which survived (albeit many with likely serious injuries). It’s now prohibited to jump off now, so unless you want prison, you won’t have your wish granted now. 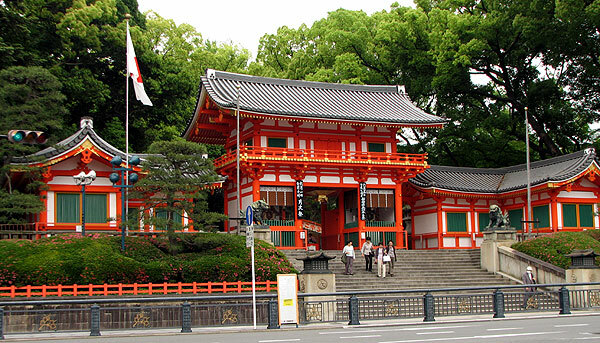 This view of the city of Kyoto is one of the things that distinctly identify the temple. Sticking out from the centre of it all is the Kyoto Tower. It’s real clear here that there’s no absolutely no super tall buildings which allows an uncluttered view of the mountains in the distance. This huge, dramatic statue is in the same area. Unfortunately, I don’t remember its significance and the web sites I consulted when preparing this post do not seem to mention this. 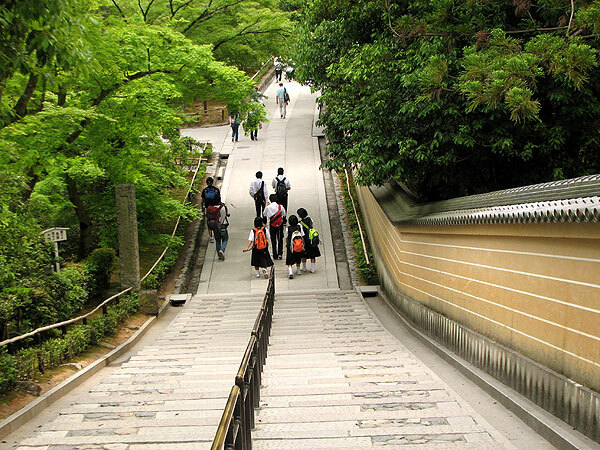 Check my gallery for the rest of the photos from the Kiyomizu Temple area of Kyoto! While in Osaka, students from the lab hosting me took me to see Kyoto. 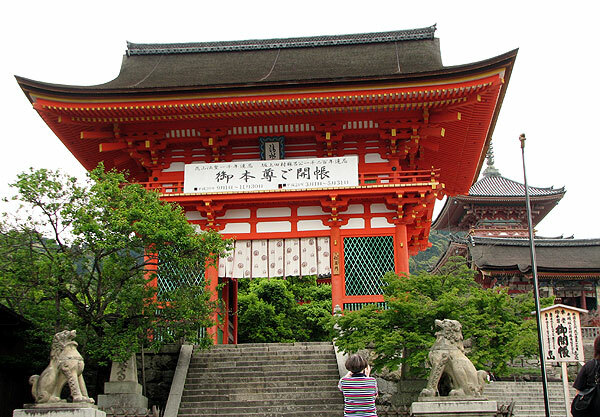 I have separated my photos into two sections: the Temple of the Golden Pavilion which I will talk about in this post, and the Kiyomizu Temple in my next post. This is downtown Kyoto. This is about as tall as the buildings get, because although the city is very large, it has laws regulating the height of its buildings. 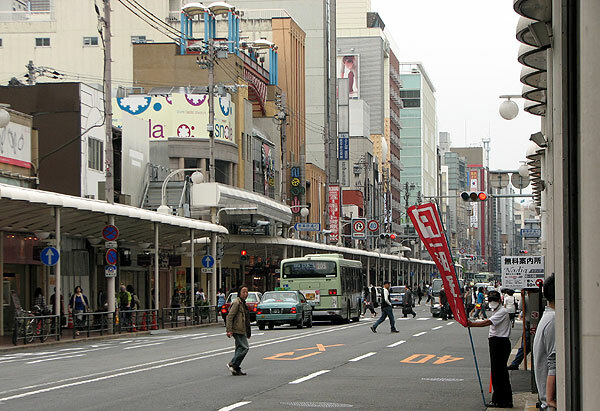 Osaka, which I’ll talk about in later posts, has no such laws, so building height is a free-for-all there. In this area, you can find many buildings constructed in the old style. It is expensive to build them like this now, so the style is preserved in the older architecture. 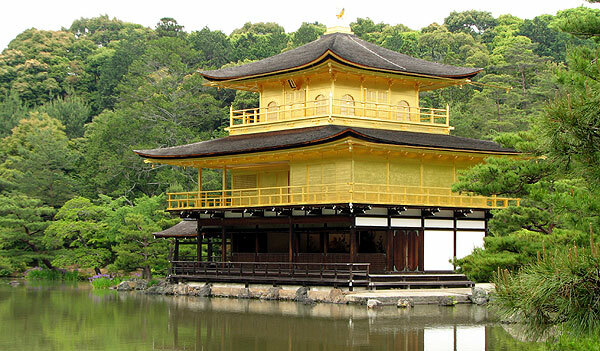 Here is the Golden Pavilion itself. 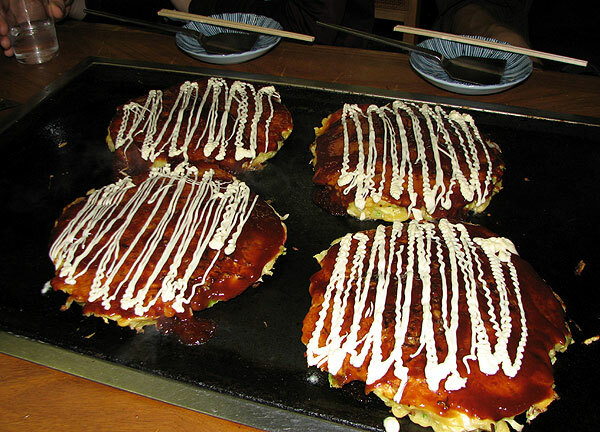 It is the most popular tourist attraction in Kyoto. Its shingles on the second and third floors are entirely gilded with gold leaf. 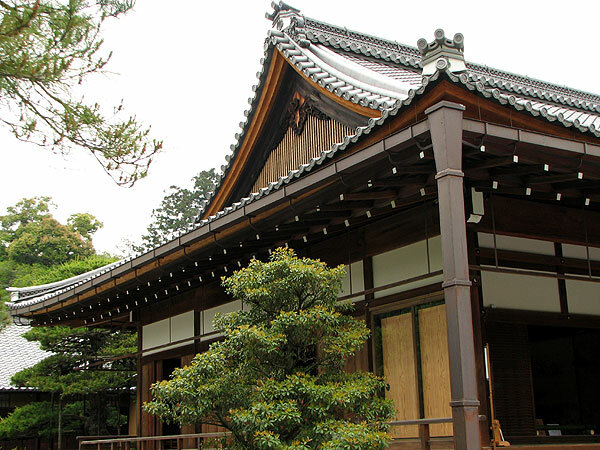 The pavillion was originally built as a retirement villa by Shogun Ashikaga Yoshimitsu in the 14th century. 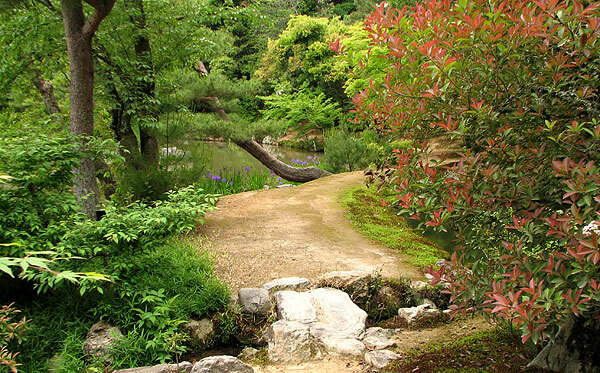 This explains the beautiful gardens and scenery surrounding the area. 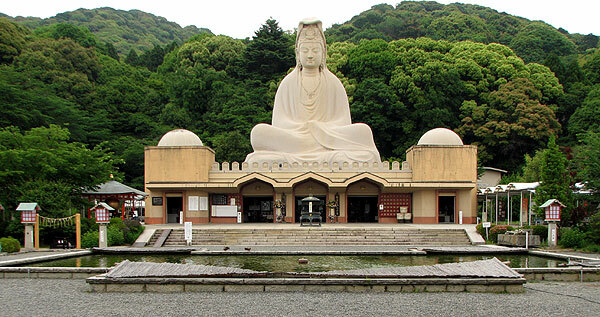 It was later converted into a temple by Yoshimitsu’s son. 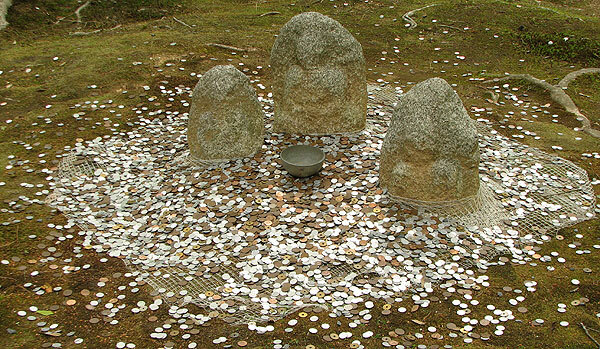 Ahh finally, a use for those small Japanese coins that don’t actually buy anything unless you have a truckload of them. If you manage to get a coin in the cup, it’s good luck. Judging by the sight here, lots of unlucky people had walked by before me! 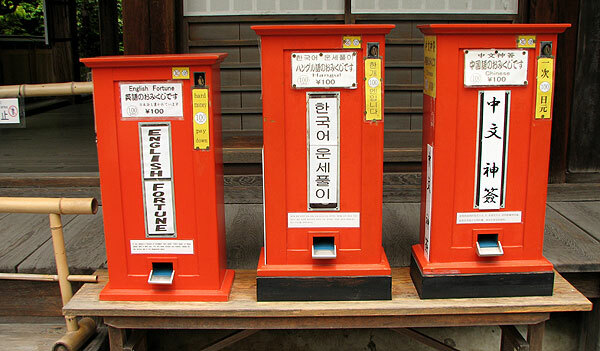 I bought my fortune, in Japanese, at a machine similar to these. 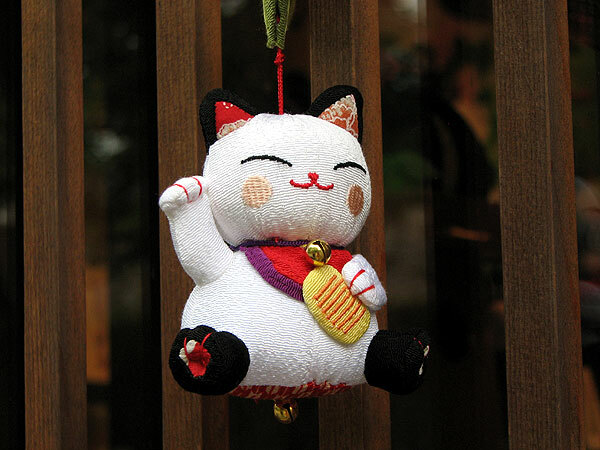 Although I couldn’t read it myself, I was told it said “very good” luck, which is the best you can get! It is best to arrive early, to have any chance at beating the crowds of school children. Virtually all of the elementary school children in the nearby cities go on field trips to this area at some point. After a morning at the Golden Pavilion, it was time for lunch. We went to a restaurant that specializes in creating these pancakes which are cooked right on the table where you sit. The ingredients are mixed right in front of you! That’s all for now. Check my gallery for the rest of the photos from my first part of Kyoto.